Billy Jealousy already has an amazing reputation of a leading male brand, but what MANY may not realize is that it's actually a brand that's good for ANYONE! All Billy Jealousy products are specifically formulated to cleanse and promote good health, texture, and tone of your skin....and....they work! Here are just a few reasons why I love this brand and a few of my FAVORITE products! I love the affordability of their products! AND...they last! Billy Jealousy is a brand that cares and donates a portion of EVERY sale to amazing charitable organizations such as Big Brother, Big Sister...just to name a few! Billy Jealousy Assassin Deep Exfoliating Scrub - a fantastic weekly scrub for that extra exfoliation! Billy Jealousy Shave3Some - my hubby loves all of these products! AMAZINGLY smooth shaves AND a perfect stocking stuffer! 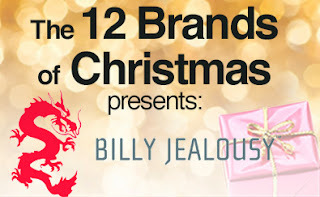 BTW - if you're looking for a GREAT guy gift...check out the Billy Jealousy kits here! Wanna win one of these amazing kits? Check out our Facebook 12 Brands Page for your chance to enter! Until next time.....stay tuned and stay beautiful!